Property insurance claims adjusting is done by Secretary David Baughman. This gives Dekalb Farm Mutual policyholders the very best in prompt, personalized service from the date of loss to finalization of the claim. Auto and liability insurance claims are adjusted by insurance claims specialists from Grinnell Mutual Reinsurance Co. Claims are reported to Dekalb Farm Mutual agents. Our agents work directly with Grinnell Mutual Reinsurance Company adjusters to give our policyholders prompt, personalized service. 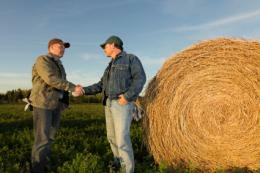 Dekalb Farm Mutual has been reinsured with Grinnell Mutual Reinsurance Company since 1985. View photos of last year's antique tractor pull here.